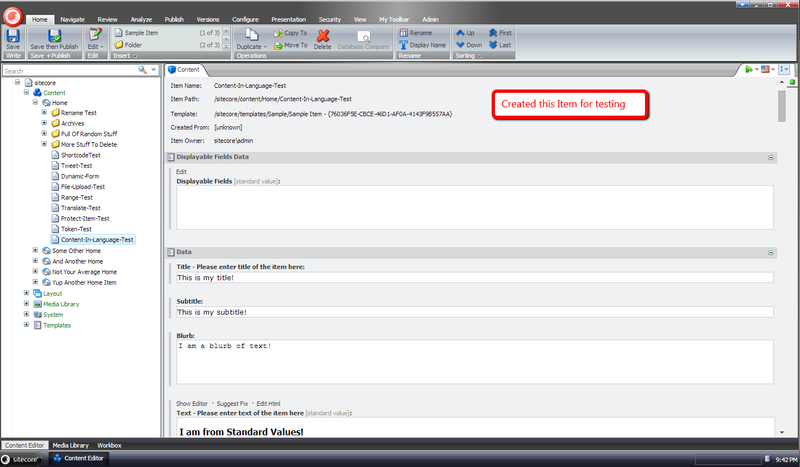 In my previous post I created a custom Content Editor image field in the Sitecore Experience Platform. This custom image field gives content authors the ability to download an image from outside of their Sitecore instance; save the image to the Media Library; and then map that resulting Media Library Item to the custom Image field on an Item in the content tree. Building that solution was a great way to spend a Friday night (and even the following Saturday morning) — though I bet some people would argue watching cat videos on YouTube might be better way to spend a Friday night — and even gave me the opportunity to share that solution with you guys. This gave me an idea: why not modify the solution from my previous post to give the ability to download a random image from Giphy via their the API? You might be asking yourself “what is this Giphy thing?” Giphy is basically a site that allows users to upload images — more specifically animated GIFs — and then associate those uploaded images with tags. These tags are used for finding images on their site and also through their API. You might be now asking “what’s the point of Giphy?” The point is to have fun and share a laugh; animated GIFs can be a great way of achieving these. Some smart folks out there have built integrations into other software platforms which give users the ability pull images from the Giphy API. An example of this can be seen in Slack messaging application. As a side note, if you aren’t on the Sitecore Community Slack, you probably should be. This is the fastest way to get help, share ideas and even have some good laughs from close to 1000 Sitecore developers, architects and marketers from around the world in real-time. If you would like to join the Sitecore Community Slack, please let me know and I will send you an invite though please don’t ask for an invite in comments section below on this post. Instead reach out to me on Twitter: @mike_i_reynolds. You can also reach out to Sitecore MVP Akshay Sura: @akshaysura13. Before I dig into the solution below, I do want to let you know I will not be talking about all of the code in the solution. Most of the code was repurposed from my previous post. If you have not read my previous post, please read it before moving forward so you have a full understanding of how this works. 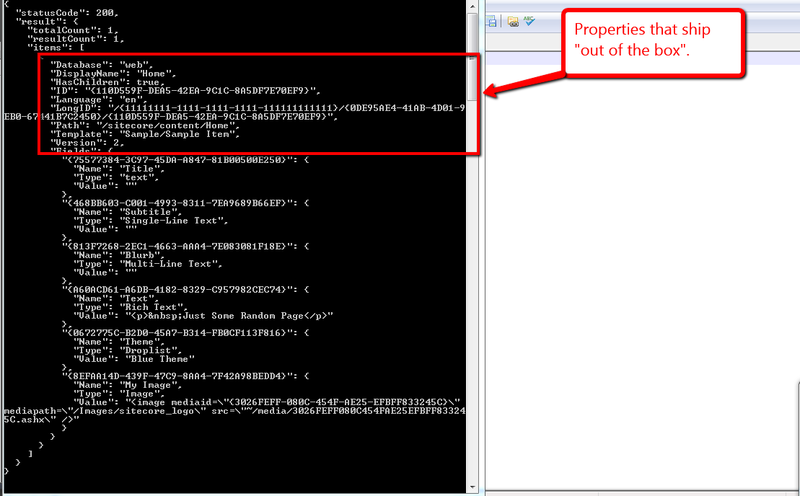 To get data out of this JSON response, I decided to use Newtonsoft.Json. Why did I choose this? It was an easy decision: Newtonsoft.Json comes with Sitecore “out of the box” so it was convenient for me to choose this as a way to parse the JSON coming from the Giphy API. Every property above in every class represents a JSON property/object in the response coming back from the Giphy API. Code in the methods above basically take in tags for the type of random image we want from Giphy; build up the request URL — the template of the request URL and API key (I’m using the public key which is open for developers to experiment with) are populated via the Sitecore Configuration Factory (have a look at the patch include configuration file further down in this post to get an idea of how the properties of this class are populated); make the request to the Giphy API; get back the response; hand the response over to some Newtonsoft.Json API code to parse JSON into model instances of the classes shown further above in this post; and then return the nested model instances. The class above does not differ much from the Image class I shared in my previous post. The only differences are in the instantiation of an IGiphyImageProvider object using the Sitecore Configuration Factory — this object is used for getting the Giphy image URL from the Giphy API; the GetGiphyTags() method prompts the user for tags used in calling up a random image from Giphy; and in the GetGiphyImageUrl() method which uses the IGiphyImageProvider instance to get the image URL. The rest of the code in this class is unmodified from the Image class shared in my previous post. Be sure to check out the patch include configuration file from my previous post as it contains the custom pipeline that downloads images from a URL. 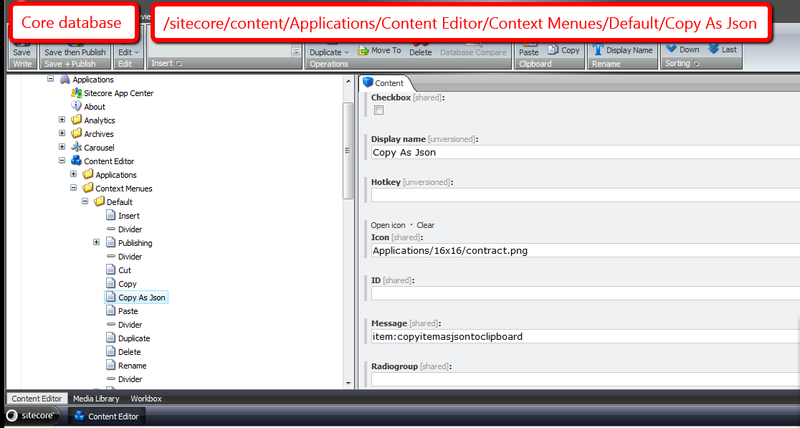 You should also refer my previous post which shows you how to register a custom Content Editor field in the core database of Sitecore. If you have any thoughts on this, please share in a comment. The other day I had read a forum thread on SDN where the poster had asked whether one could determine if content returned from the Sitecore Item Web API for an Item was the actual content for the Item in the requested language. I was intrigued by this question because I would have assumed that no results would be returned for the Item when it does not have content in the requested language but that is not the case: I had replicated what the poster had seen. The code in the above class checks to see if the Item has content in the requested language — the latter is set in the Language property of the Item instance, and the Languages property contains a list of all languages it has content for. The Item does have content in English, and this is denoted by the ‘HasContentInLanguage’ property. As expected, the ‘HasContentInLanguage’ is false since the Item does not have content in French. If you have any questions or thoughts on this, please drop a comment. In a previous post, I showcased a “proof of concept” for shortcodes in Sitecore — this is a shorthand notation for embedding things like YouTube videos in your webpages without having to type up a bunch of HTML — and felt I should follow up with another “proof of concept” around incorporating Embedded Tweets in Sitecore. 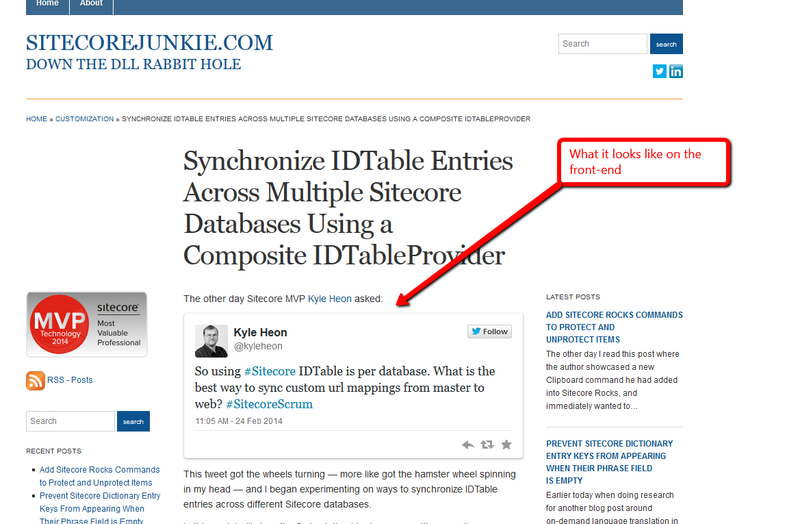 You might be asking “what’s an Embedded Tweet?” An Embedded Tweet is basically the process of pasting a Tweet URL from Twitter into an editable content area of your website/blog/whatever (think Rich Text field in Sitecore), and let the code that builds the HTML for your site figure out how to display it. I decided to omit some of the JSON properties returned by the Twitter URL from my class above — width and height are examples — since I felt I did not need to use them for this “proof of concept”. 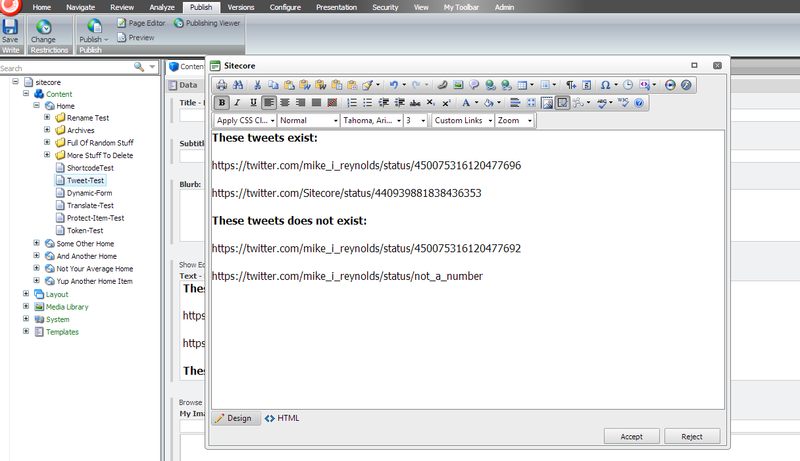 || fieldTypeKey == "rich text"
|| fieldTypeKey == "single-line text"
Methods in the class above find all Tweet URLs in the Rich Text, Single-Line Text, or Multi-Line Text field being processed — the code determines if it’s a Tweet URL based on a pattern that is supplied by a configuration setting (you will see this below in this post); extract Tweets’ Twitter identifiers (these are located at the end of the Tweet URLs); and attempt to find the Tweets’ HTML in Sitecore’s HTML cache. 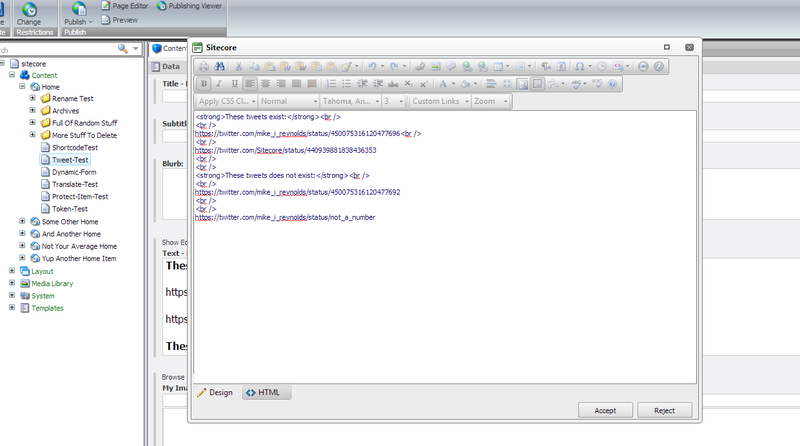 If the HTML is found in cache for a Tweet, we return it. Otherwise, we make a request to Twitter’s API to get it, put it in cache one we have it (it is set to expire after a specified number of milliseconds from the time it was retrieved: Twitter returns the number of milliseconds in one full year by default), and then we return it. If the returned HTML is not empty, we replace it in the field’s value for display. If the HTML returned is empty — this could happen when an exception is encountered during the Twitter API call (of course we log the exception in the Sitecore log when this happens 😉 ) — we don’t touch the Tweet URL in the field’s value. Once all Tweet URLs have been processed, we append a script tag referencing Twitter’s widget.js file — this is supplied through a configuration setting, and it does the heavy lifting on making the Tweet HTML look Twitterific 😉 — to the field’s rendered HTML. 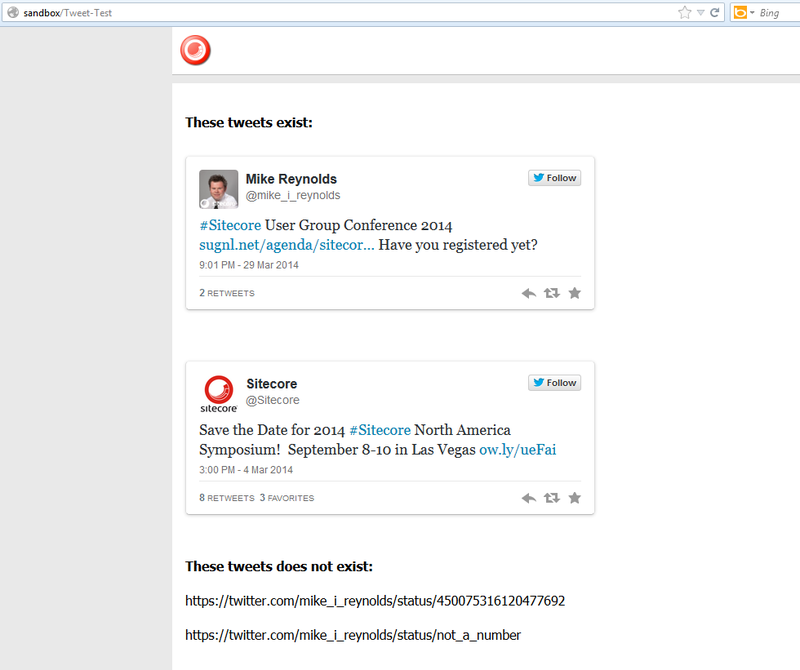 If you have any suggestions on making this better, or have other ideas for embedding Tweets in Sitecore, please share in a comment. The other day I was exploring pipelines of the Sitecore Item Web API, and took note of the itemWebApiGetProperties pipeline. 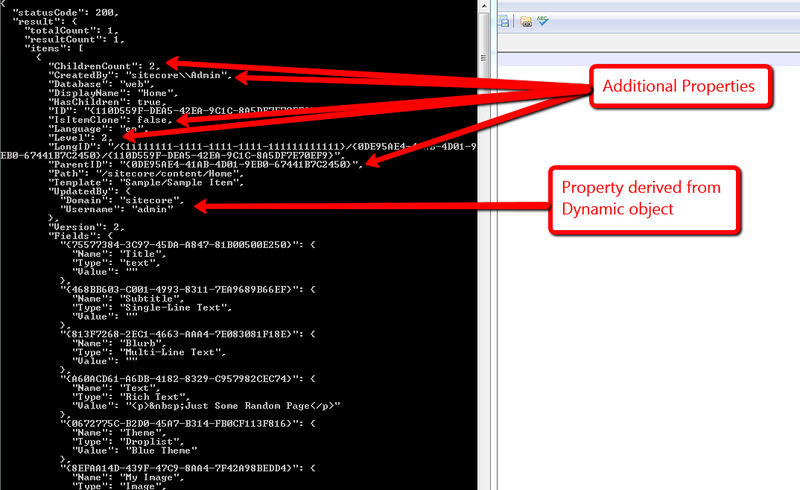 This pipeline adds information about an item in the response returned by the Sitecore Item Web API. You can find this pipeline at /configuration/sitecore/pipelines/itemWebApiGetProperties in \App_Config\Include\Sitecore.ItemWebApi.config. 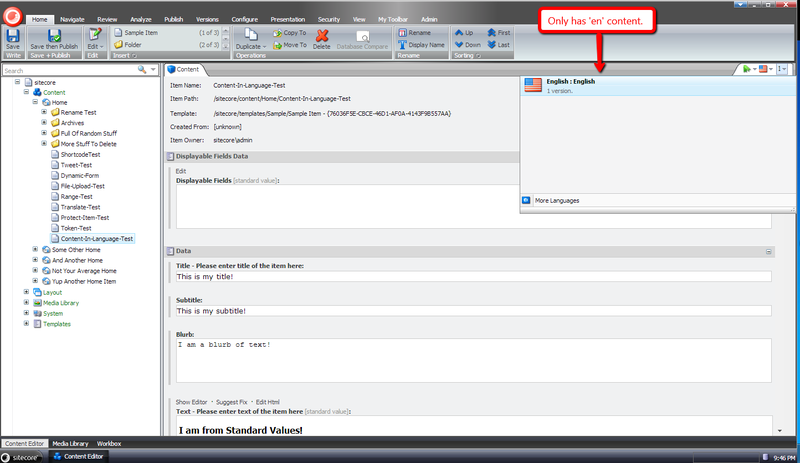 You might be asking “how difficult would it be to add in my own properties?” It’s not difficult at all! 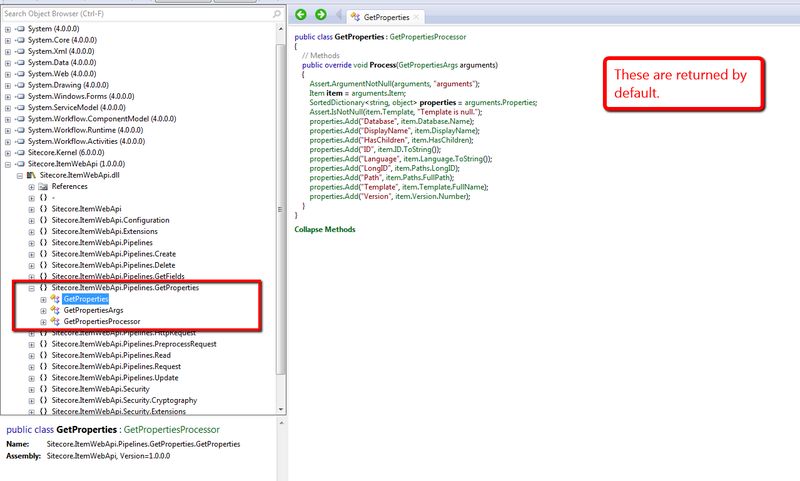 The ParentID, ChildrenCount, Level and IsItemClone properties are simply added to the properties SortedDictionary within the GetPropertiesArgs instance, and will be serialized as is. For the UpdatedBy property, I decided to leverage the Sitecore.ItemWebApi.Dynamic class in order to have the username set in the “__Updated by” field be represented by a JSON object. This JSON object sets the domain and username — without the domain — into different JSON properties. Let’s take this for a spin. As you can see, our additional properties are now included in the response. If you can think of other item properties that would be useful for Sitecore Item Web API client applications, please share in a comment. Until next time, have a Sitecorelicious day! With all the exciting things happening around json recently — the Sitecore Item Web API (check out this awesome presentation on the Sitecore Item Web API) and pasting JSON As classes in ASP.NET and Web Tools 2012.2 RC — I’ve been plagued by json on the brain. For the past few weeks, I’ve been thinking about building a Sitecore client command that copies fields values from a Sitecore item into a string of json via the clipboard, though have been struggling with whether such a command has any utility. Tonight, I decided to build such a command. Here is what I came up with. The command above iterates over all fields on the selected item — not including those that are defined in the Standard Template — and builds a string of json containing field names accompanied by their values. I found this article by John West to be extremely helpful in writing the code above to determine if a field belongs to the Standard Template — this is used when leaving out these fields in our resulting json string. Further, the command is only enabled when the selected item has fields coupled with the CommandState returned by a call to the QueryState() method on an instance of Sitecore.Shell.Framework.Commands.CopyToClipboard — this object’s QueryState() method checks things we care about, and I wanted to leverage its logic. Let’s see this thing in action. If you can think how this, or something similar could be useful, please drop a comment. Did you know squirrels love eating bananas? Neither did I until yesterday when I was enlightened by this tweet. Immediately, I knew I had to carve out a corner in the banana-loving-rodent market. What better way to acquire leads than by offering free stuff after signing up for an account? I just needed an unsquirrely way to save answers to questions on my signup form to help me better understand my prospective customers. I decided to take advantage of Sitecore’s ability to save custom information on user profiles but wanted to avoid passing strings directly to my users’ Sitecore.Security.UserProfile objects — saving lots of information in a string can be cumbersome if not downright messy. Under the same JSON theme of the Sitecore Item Web API, I decided to build a wrapper class around the UserProfile object that uses an utility object to serialize/deserialize objects to/from strings of JSON before saving/retrieving. 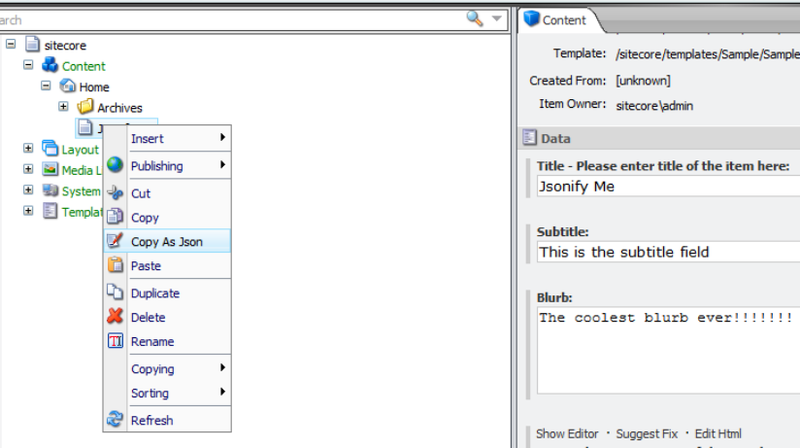 Knowing the Sitecore Item Web API converts objects into JSON, I poked around Sitecore.ItemWebApi.dll (v1.0.0 rev. 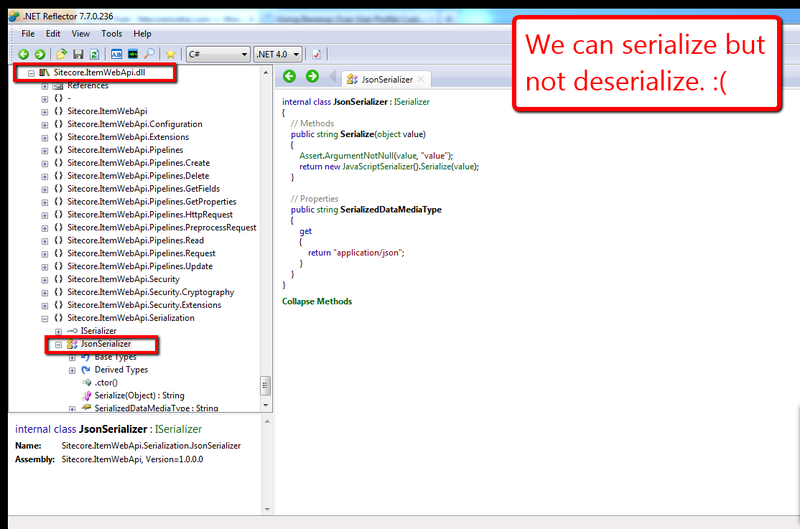 120828) using .NET Reflector in search of a serializer I could use in my solution. As I expected, I found a class that serializes objects into strings of JSON. The JsonSerializer class above not only gives client-code the ability to serialize objects into JSON strings, but also offers methods for deserialization. The UserProfile wrapper above offers client-code the option of passing in their own serializers — as long as their serializers implement the ISerializer interface I defined above — or provides an instance of the JsonSerializer by default. 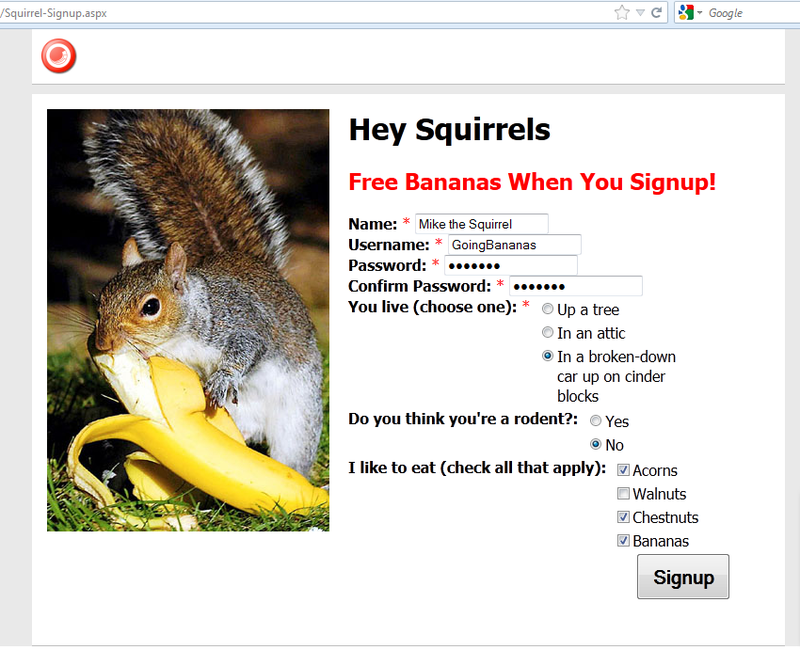 Free Bananas When You Signup! ErrorMessage="<br />Please tell us your name!" ErrorMessage="<br />Please enter a username!" ErrorMessage="<br />Please confirm your password!" ErrorMessage="<br />Please choose one domicile!" Text="Do you think you're a rodent? :"
Just to let you know, the logic in sublayout’s code-behind is not very robust — it throws an exception when users refresh the “confirmation” page after creating an account (I’m not checking to see if the user had already created an account and is logged in). 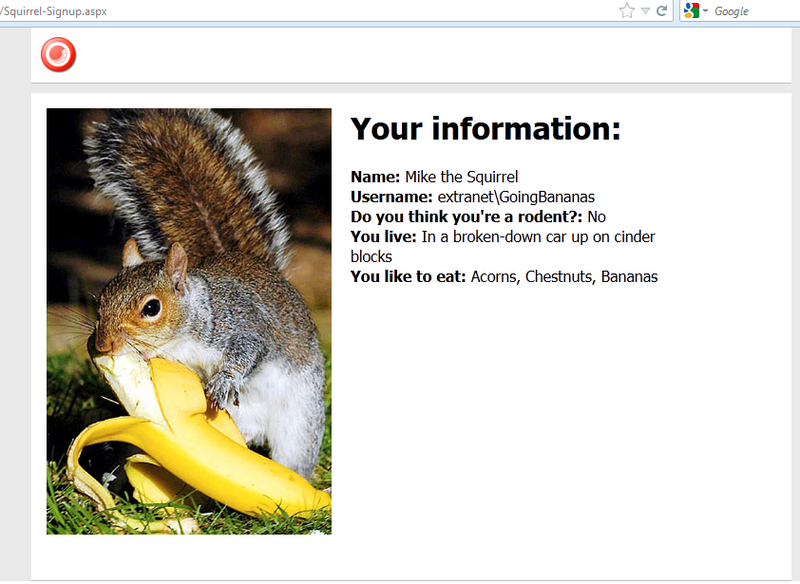 Plus, it’s in need of refactoring — I should move the SquirrelInformation class into its own file. I promise I’ll go back and clean it up. I just needed to get it out the door. Winter is quickly approaching and I need to market my bananas as soon as possible. I need to reap in some dough to buy and bury more acorns.